If you are looking for the best pocket wifi in Japan out of the numerous Japan pocket wifi rental providers, you should seriously consider getting Pupuru Pocket Wifi. I’ve used Pupuru myself at least 5x in my past trips to Japan and I strongly recommend them for their consistent reliable service and blazing fast “only in Japan” wifi internet speeds. 🙂 So here goes my review of Pupuru Pocket Wifi since a number of people have been asking me on how to stay connected in Japan while on the go. What is a Pocket Wifi and Why Rent One in Japan? For those who are so used to mobile data connection, a pocket wifi is a small portable wifi router which can provide wifi connection up to 10 devices while you are on the go. Prepaid sim cards are heavily regulated in Japan and it is not very easy to get one straight from the stores. If you don’t want to be charged exorbitant global roaming data fees, you may want to consider renting a pocket wifi for the duration of your Japan trip. I suggest that you book your Japan pocket wifi rental online at least 1 to 2 weeks in advance to ensure availability. If you will be visiting Japan during spring or autumn peak season, it maybe wise to book months ahead to secure your pocket wifi rental. 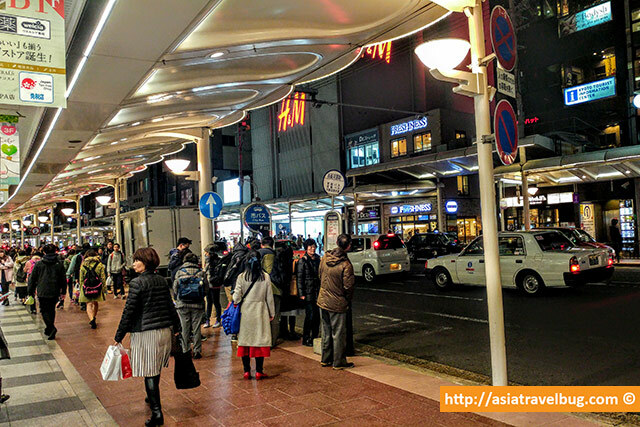 Before I share my Pupuru Pocket Wifi experience, let me tell you 5 reasons why a mobile internet connection in Japan is a “necessity” rather than a “want” for tourists. Of course, a pocket wifi connection will enable you to do a live tweet that you have just been awe-struck by Mount Fuji! But the benefits of having a pocket wifi in Japan goes way beyond that. 1. Free wifi is not everywhere. Being a country known for ultra fast internet connections, everyone has high expectations of Japan thinking that free wifi can be accessed everywhere. But the reality is that free public wifi is not widely available unless you intentionally go to a major train station or drop by a 7-11. While it is undeniable that public wifi hotspots have increased in the past 5 years, these free public wifi hotspots in Japan can hardly be relied on when you need it the most. When I went back to Kyoto recently, I tried to access the free Kyoto Public Wifi Hotspot right in the middle of downtown at the intersection of Kawaramachi and Shijo avenues (Kyoto’s equivalent of Ginza’s shopping strip). To my disappointment, I was unable to access Kyoto’s public wifi hotspot even after trying hard to register many times. After 30 minutes, I gave up and went back to my tried and tested Pupuru Pocket Wifi. This accessibility issue on free wifi hotspot seems to be a problem not only in Kyoto. 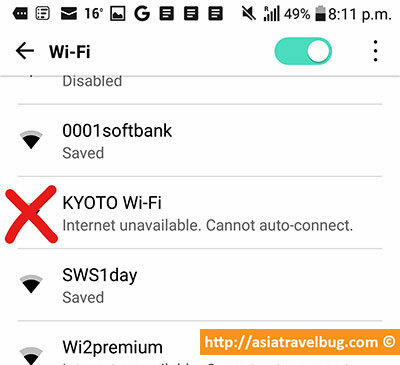 When I tried connecting to free public wifi hotspot while in Asakusa, a major tourist area in Tokyo, I was able to access it but the public wifi was very slow making it unusable. 2. Lack of street names and signs. The address system in Japan is different from other countries and most often, only main avenues have street names. Addresses in Japan are in a combination of district numbers, block numbers and building numbers which any foreigner will find to be very confusing. I can still vividly remember a time a when I made a wrong turn in a Kyoto back alley and ended up getting lost for an hour. I got lost in a quiet residential neighborhood in a freezing cold evening, with dark alleys, no foot traffic, no street signs, no wifi and no google maps access. My ordeal could have been different had I had an access to wifi. I learned the “need” for a pocket wifi during my first trip to Japan the hard way. Most Back Alleys in Japan Don’t Have Street Signs. 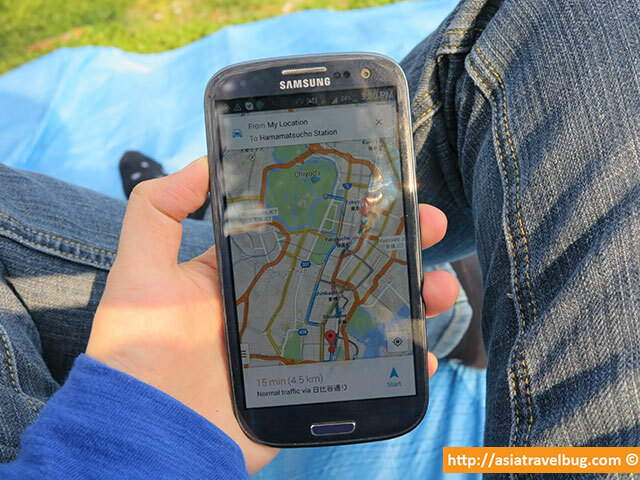 Sometimes, you will need google maps with GPS to determine your exact location if you get lost. This photo was taken in lively Shinjuku, Tokyo. 3. No offline download of google maps in Japan. A few days prior to my Tokyo trip, I was preparing the travel apps on my phone when I realized that Google doesn’t allow offline maps in Japan. This appears to be a local restriction in Japan as I haven’t encountered any problems downloading offline google maps for other countries where I’ve travelled to before. 4. Prohibitively expensive taxi fares. A 30 minute cab ride in Japan can easily cost you between USD 50 to USD 60. I would rather use this money to fund a week of pocket wifi rental, use my google maps and find my way to the nearest train station to commute from point A to B. 5. Highly complex train stations and rail systems. Taking a train in major stations like Tokyo and Shinjuku will require advance planning. Imagine, each of these major stations have more than 30 rail and metro platforms! Sometimes your itinerary will not go as planned so you have to be prepared to re-adjust your train commuting plans while on the go. Having an online access to hyperdia on your mobile will help you pinpoint the fastest train route just when you need it. 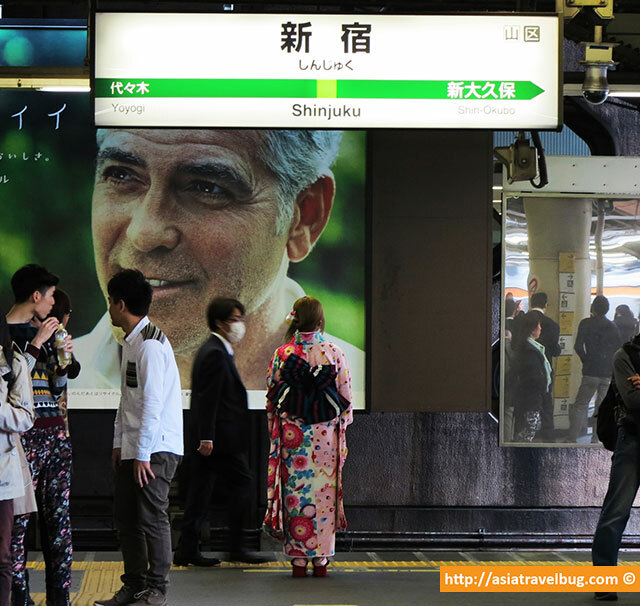 Did you know that Shinjuku Station has 36 rail and train platforms? No wonder, almost every tourist gets lost here. There are a number of pocket wifi rental companies in Japan and my google search led me to 3 different providers with reasonable prices – Pupuru, Global Advanced Communications (GAC) and wifi-hire. All of these providers rent out high-speed unlimited pocket wifis within similar price range of about USD 70 for 1 week of rental or just about USD 10 per day. If you will be in Japan for less than a week, the pocket wifi rental fee will definitely cost less. 1. Extensive Coverage. I availed the Au broad-coverage 75 mbps unlimited pocket wifi rental from Pupuru and was very happy with its extensive coverage. During my trip to Tokyo, Kyoto, Osaka, Lake Kawaguchi, Hakone, suburb areas surrounding Mount Fuji and Japan Alps, I was able to get wifi connection 99% of the time from my Pupuru pocket wifi. The only time that the wifi connection went down was during the 30-minute Lake Ashi pirate ship cruise in Hakone. However, this is highly understandable since the lake is surrounded by mountain ranges and the downtime only lasted for 30 minutes. I was able to make a live social media post showing Mount Fuji from Gotemba. Thanks to Pupuru Pocket Wifi for making this possible! 2. Extra Long Battery Life. Based on my personal experience having used Pupuru at least 5x on separate occasions, my Pupuru pocket wifi really lasted for 9 to 12 hours as advertised! You have to be aware that not all pocket devices are created equal. Other pocket wifi rental providers in Japan offer 21 mbps pocket wifi for a cheaper price. The 21 mbps internet connection speed is actually sufficient but the battery life of these pocket wifi variants only last for half day and it can only be connected up to 5 devices. 3. High Availability of Pocket Wifi Units. My initial choices were a toss between GAC and Pupuru since both provide similar services with almost same prices. It is no doubt that GAC is more popular. However, when I tried to book for a pocket wifi unit from GAC’s website, I was informed a day after I submitted my booking that their pocket wifi is out of stock for my travel dates. So I went to book with Pupuru’s website and it went without a hitch. Since then, I always book with Pupuru and they always have stock even if I head to Japan during super peak seasons most of the time. Upload and organize thousands of my travel photos online while in Japan in a matter of minutes. I always struggle to upload my travel photos and videos back home and it takes me up to a week to upload 2,000 to 4,000 photos. With 25mbps upload speed of Pupuru, it’s amazing to see that I’m able to literally upload tons of photos and videos in a span of minutes! Make video calls on Skype whenever and wherever I want. 6. Easy Delivery and Return. What’s good about Pupuru is they include a prepaid envelope so you don’t need to worry about the return process. I have used Pupuru’s service at least 5 times and had my pocket wifi sent to different hotels and different airport counters on separate occasions. So far, my rented pocket wifi from Pupuru had always arrived ahead of me ready for my pick up. For hotel deliveries, I just pick it up from the front desk upon check-in. You have to email the hotel in advance that you are expecting a package. The hotels will be happy to receive your pocket wifi package for you as long as the recipient name matches with the guest name in your hotel booking and the rental has been pre-paid online. 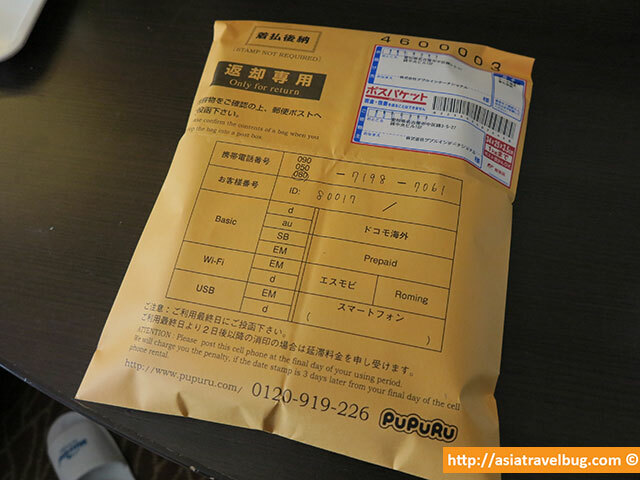 The return process of Pupuru is likewise very easy since a prepaid courier envelope is sent together with the pocket wifi package. I just zipped up the pocket wifi and its accessories back in the black pouch after use, sealed it in the provided orange prepaid courier envelope and left it to the hotel concierge for mail back to Pupuru. See, the return process is as easy as 1-2-3 but make sure you return the the rented pocket wifi while you are in Japan. Will I use Pupuru Pocket Wifi again when I return to Japan? Definitely, yes! I have used Pupuru at least 5 times in the past and would not hesitate to avail their services again in the future. Pupuru has proven to be a a very reliable pocket wifi rental provider with customer service willing to go the extra mile based on my first hand account experience. My USD 70 Pupuru unlimited pocket wifi rental for a week delivered more than what its worth – a great peace of mind knowing that I have a functioning google maps to save me in case I get lost! 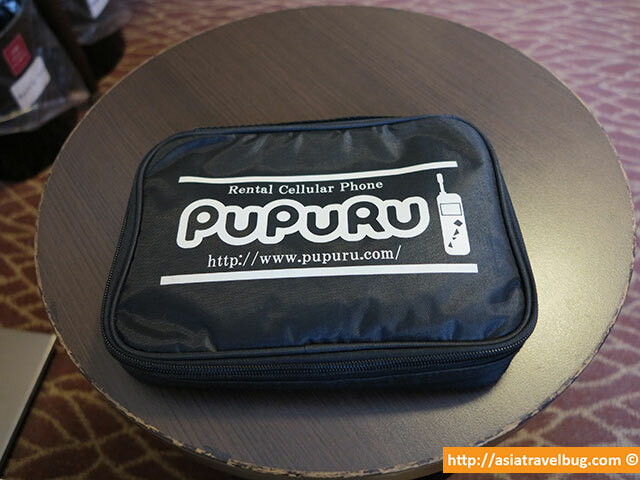 Pupuru is highly recommended by Asiatravelbug as a pocket wifi rental provider in Japan. Make sure to book one before you go! So how do I book a Pupuru Pocket Wifi rental? The booking process is easy. Reservation and payment can be done online. 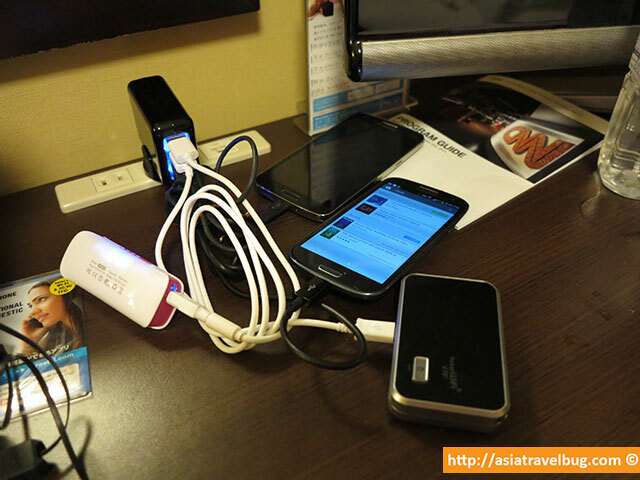 It is recommended that you book at least 1 to 2 weeks in advance to ensure availability of pocket wifi units. If you will be going to Japan during spring or autumn peak season, it maybe wise to book months in advance to secure your pocket wifi rental. 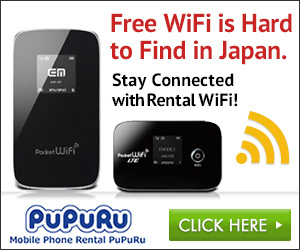 You can book your Pupuru pocket wifi rental here. Heading to Tokyo, Kyoto or Osaka and unsure where to stay? Don’t worry! Check out Asiatravelbug’s Where to Stay in Tokyo, Where to Stay in Kyoto and Where to Stay in Osaka guides. Love your blog! Can I have this delivered to Naha airport or hotel? We are starting our trip in Okinawa. Thanks in advance. Hello Angie! I’m sorry I missed your message and apologies for the delay in my reply. While Pupuru doesn’t have a pick up counter at Naha airport in Okinawa, you can always have your Pupuru pocket wifi delivered to your hotel in Naha. Wishing you a happy trip to Japan! Do you recommend the broad coverage unit over the regular one? its 200yen/day more. We will be traveling up to hokkaido and back. Also yes or no on the insurance? do you buy it? Thank you very much for leaving a comment. If you’re going to Hokkaido, I strongly recommend Pupuru’s Au broad-coverage pocket wifi. I’ve used Pupuru’s broad-coverage pocket wifi 2x this year to navigate the beautiful mountains and alps in central Japan. It consistently worked in remote mountainous areas and even under mountain tunnels. It worked perfectly in city areas too! As for insurance, it depends on your personal risk tolerance. Personally, I often get the Standard Insurance so I’m covered at least 50% in case of unforeseen circumstances. If you are totally risk-averse, then you can consider the Premium Insurance option. Hope this helps and please enjoy your trip to Hokkaido! Is it possible to return the pocket WiFi at terminal 2 in Narita? Are there red post office boxes available in the airport before checking in? We would like to stay connected en route to the airport with our 4 children when we fly out of Tokyo. Yes, you can drop off your Pupuru pocket wifi at red post boxes at Narita Airport Terminal 2. Just make sure that use the yellow return envelope provided, and you drop it off “before” you enter the security/immigration area. The red post boxes are normally around the area of airline check-in counters. For Narita terminal 2 post box information, you may refer to below. I hope this helps and I wish you and your family a fun trip to Japan! Hi Tiffy, My husband and I will be in Japan Nov. 28- Dec.7 visiting the cities of Osaka, Nara, Kyoto and Tokyo before boarding a cruise ship in Yokohama. Thank you in advance for addressing my questions. 1) While in Japan, we would like to be able to use Google maps to get around cities and the subway, to read emails and text messages on our iPhones, and to perhaps use online museum explanations of artwork. Could we do this for free with the Pupuru wifi? 2) Also, don’t understand when the rental form asks for the number of devices. My husband and I will each have our iPhones for the first 6 days, and the last two days, my sister and brother-in-law will join us and would like to use the wifi. Do we have to pay for each phone or device? I am confused because I also read: “Pupuru Pocket Wifi Online Booking – ~USD 70 for 1 Week Shareable up to 10 Devices.” If this is true, why do they ask for the number of devices? 1a) Google maps and reading emails – Yes, you can do this without additional charge when you have Pupuru pocket wifi. The important thing though is to make sure you are connected to Pupuru wifi and you have turned off “mobile data” on your mobile phone to avoid accidental data global roaming charges from your home telco carrier. 1b) Text messages – This actually depends on your telco carrier if there is cost to receive international text and how much it would cost to send an international text. While receiving international text can be free or with minimal cost from your telco carrier, what’s more typically expensive is actually sending of international texts. Once you are connected to Pupuru wifi, you can actually send messages online for free such us Skype, Facebook Messenger, etc., so you can do away from sending international texts. 2) Yes, it’s true that you can connect up to 10 devices at a time to Pupuru wifi. In Pupuru’s website, they’re actually asking the number of “Pupuru pocket wifi devices” which you would like to rent, rather than the number of mobile/tablet/laptop devices which you plan to connect to your Pupuru wifi. There are cases wherein its practical to book 2 or more Pupuru pocket wifi devices, let’s say you are with a big group and not all have the same itinerary (i.e. perhaps one would like to go shopping while the others would like to explore a tourist site in another area). It looks like you and your husband will be together all the time, so if this is the case, then getting just 1 Pupuru pocket wifi device will be sufficient. Hope this helps and have a safe trip! Hi Tiffy, I have ordered my Pupuru WIFI and phone for our December 2018 trip, and then Pupuru sent a confirmation and requested a copy of my Passport which they say is required by Japanese law (for the phone). Before I send Pupuru a copy of my passport, which makes me very uncomfortable, I wanted to check the accuracy of this request with you. Without the passport they say they can not send the phone to our hotel. Are you familiar with this law? Some years back, emailing of passport is required to rent pocket wifi regardless of the pocket wifi provider. I’ve emailed my passport several times to Pupuru before with no issues. 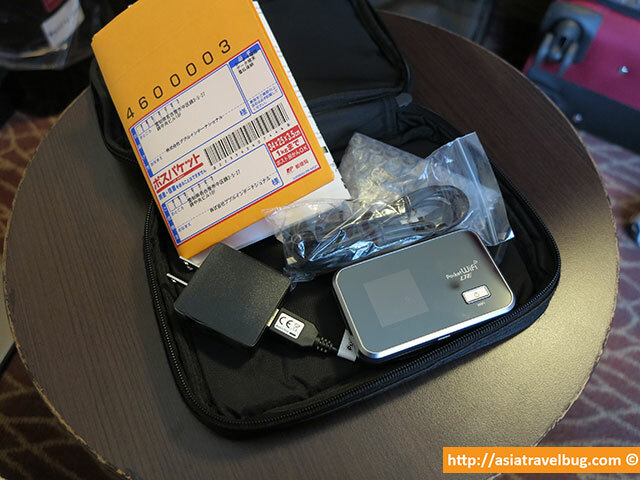 The Japanese law has removed the passport requirement for pocket wifi rental a few years back. For mobile phone rentals however, I think it is still required since there is a mobile sim card inserted on it. I believe that this a Japanese law requirement which Pupuru needs to enforce to abide with local government regulations, rather than their own policy. So it is highly likely that you will encounter this passport requirement regardless of the mobile phone rental provider you choose in Japan. To ease your concern, you can password protect the PDF copy of your passport and send the password to them separately or via other means if you wish. Hope this helps and enjoy your Japan trip! Your article gave me some amazing inputs, thanks. I plan to get the pocket wifi delivered at the Narita Airport Terminal itself- my question is can I start using it immediately or do I need to charge it ( using a power bank or on the Narita Express )? Based from my experience having ordered Pupuru pocket wifi in my past 6 trips to Japan, it always came as fully charged and ready to use. To answer your question, yes, you can immediately use it once you receive it at Narita Airport. hey with your recommendation i ordered. I leave for Japan on Aug 18 for 2 weeks and i will definitely let you know how it went when i get back! Thanks again for all the great info! Thanks Yasir! I’m sure you’ll have great time in Japan with your Pupuru pocket wifi. I’m excited to hear how it goes after your trip. Have a safe and happy vacation! Really a great post! Much info about the pocket wifi. But may I know how to return the pocket wifi? I’m going to visit Japan soon for 6D5N. Is that mean I have to return the pocket wifi on day 5 since in your post mention that we need to return it while we are in Japan. Returning your Pupuru pocket wifi is very easy. I normally ask the hotel front desk to return the sealed envelope for me and so far they have always been very happy to oblige. You can also drop it on any Japan Post red mailbox which you can find along the side walks or at the airport before you check-in for your flight. As to the day when you should return it, it is the last day of your pocket wifi rental period. So for example, you rented it for 6 days, you should return it on the 6th day. If you rented it for 5 days and don’t need connection for the 6th day since you will already be flying home, you should return it by the end of the 5th day. I’m happy to hear that you had a great experience with your Pupuru pocket wifi! Thank you very much for taking time to share your positive experience. I’m sure your feedback will be helpful to other readers. Cheers to more travels to Japan! Hi Tiffy, we just got back from a 7 day Tokyo trip and wanted to stay THANKS! I went with Pupuru after readying your blog post and it worked out beautifully! 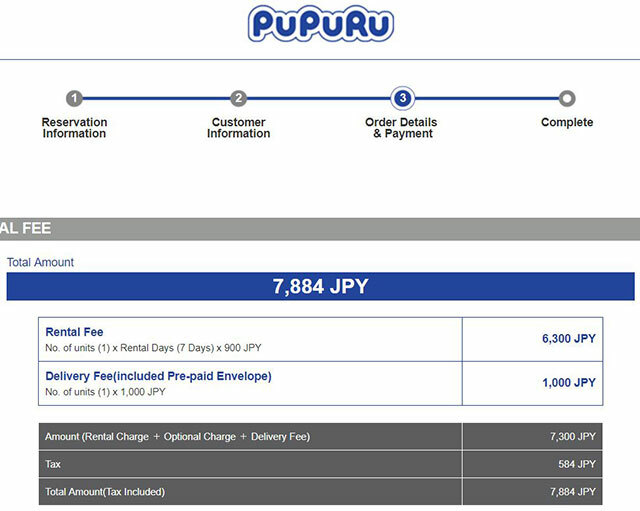 * Ordered from Pupuru website for pickup @ Narita Terminal 1. Came out to be about $7 USD per day. * Arrived and went to the QL Liner (shipping store) @ Terminal 1 South Wing (turn right after coming out of customs). Easy peasy! * Device was connected to 4 of us. My kids were streaming Youtube and playing Roblox at very fast speeds – felt like we were on home wifi. * The Airbnb we rented also provided us a WiMax pocket wifi which was trash. Horrible super slow service. * Pupuru pocket wifi functioned like a champ even in subway stations that were DEEP underground! * Package came with a return envelope so I dropped it off at a Post box. Easy to find everywhere around Tokyo. I even saw one right next to the security line @ Narita. Thanks again for this tip! I’ve been sharing this post everywhere in the Japan Travel Planning FB group. I’m very happy to hear that your family had great experience with Pupuru Wifi! Thank you very much for taking time to write about your own experience in detail. I really appreciate it. I’m sure your review will definitely help other fellow travellers. Cheers to more trips to Japan! I’m having a bit of a dilemma right now, so I’m going to Japan this summer and I’m staying at an Airnbnb and the host would be providing us pocket wifi. Now I asked her if we could take it outside and that if it is unlimited or there’s a limit. So she answered yes, we can take it outside but didn’t answer my question of it being limited or unlimited. I will ask her again, but I just feel really cautious and anxious because now I’m thinking she’s shading because she’s not answering my question and not being up front. Therefore, should I just rent the pocket wifi anyway? By the way, love your review and I’m really considering on renting this brand. Thanks for your kind words Garrett! I’ve stayed at a bnb apartment in Japan one time before and the host provided a pocket wifi instead of a broadband wifi connection. The device can also be used outside the apartment. The wifi worked quite well but it took a while for me to figure how to connect to it. Apparently, the host provided unclear instructions on how to use the apartment’s pocket wifi like missing to provide the SSID wifi name. It took me a couple of days, a couple of online messages with the host using my own Pupuru pocket wifi, and a number of trial & error to access the apartment’s pocket wifi. Actually, my Pupuru wifi saved me from a lot of trouble during my bnb experience in Japan. When I got stranded outside the apartment building due to unclear check-in procedures for more than an hour, I was able to use Pupuru pocket wifi to make several Skype calls to the bnb call center to contact the host. Without the Pupuru pocket wifi which I picked up from the airport, I could have ended up with hundreds of dollars in global roaming voice call charges. The thing with bnb apartment rentals in Japan is that service could be a hit or miss since the host is usually not the owner of the apartment unit based on my personal experience before. I hope that the current government clamp down will help make bnb service more predictable in Japan. While my own experience is not that good, there are others out there with some success stories. But if the host is not being upfront about the apartment’s pocket wifi details, I would be very wary if I’m in your situation. 1. Pocket wifi device model – The more expensive and recent models have longer battery life. From my experience, Pupuru works 9-12 hours with a single charge. Older models or cheaper pocket wifi devices tend to have shorter battery life. I’ve seen Pupuru evolve with times and they have upgraded their pocket wifi devices compared to their device offers 3-5 years ago. 2. Pocket wifi telco carrier – Similar to your mobile telco network back at home, some telco networks perform better than the others and cheaper telcos often perform poorly. In the case of Pupuru, they only provide pocket wifi either under Softbank telco (city-wifi) and Au telco (broad-coverage) wifi. Both of which are included in the top 3 most popular telco providers in Japan which even locals use. 3. The contract with the telco carrier – The usage limit varies and fair usage policy depends on the contract with the telco carrier. So even for the same Softbank pocket wifi device, the usage limit may be different. For example, it can be 1 GB per day, 10 GB per month, X Gb for a certain period, or unlimited but with 1 GB fair usage policy per day. The data limit works in the same as your mobile data plan in your home country and there’s no really one-size-fits-all general data plan for everyone. In bnb scenario, in case the previous bnb occupant has used up available data or maxed out fair usage in prior days, it is possible for you may experience slow internet speeds. In Pupuru’s case, they have special commercial contract with telco carriers with a higher fair usage policy for their unlimited wifi. In my past 6 trips, I’ve actually never experienced Pupuru wifi throttled to low speeds even if I use it as my main wifi most of the time. Should you decide to book with Pupuru and if you are arriving in normal hours, you can opt to avail the airport pick-up option since they don’t generally deliver to bnb rentals in Japan. I’m sorry if I’m unable to give you a straight answer since pocket wifi performance in apartments is really highly variable based on the factors I mentioned + the service level of the host. But I do hope that my personal experience and above explanation will help you make an informed decision. I love to read your post – very informative and useful. My family of 4 adults plan to visit Tokyo & Kyoto in October 2018. For our hotel reservation, we have to book two rooms since it is very hard to get a room for 4 persons. If we rent one pocket wifi to share among us, will the wifi connection still work when we stay at two different rooms? Or do we need to rent two wifi routers? Thanks. Thanks for your kind words. I fully understand your concern since I also travelled with group of 4 adults previously and have to stay in 2 separate rooms. I agree with you that getting a room for 4 is rare in major cities in Japan. In our situation, our rooms got assigned to different floors, hence, I wasn’t able to see if the pocket wifi range can cover 2 nearby rooms. What I can confirm though is that the pocket wifi range cannot penetrate multiple floors. Fortunately, our travel companions in the other room at that time are senior relatives and they generally do not need wifi since I do all the travel planning for them. Haha. I am actually intrigued by your unique question so I did a little experiment at home using a local pocket wifi device. While this may not exactly represent the actual wifi distance of Pupuru since my local pocket device is from a local carrier, I hope this gives you a rough idea about the wifi distance capability of a typical pocket wifi. Generally speaking and not particular to Pupuru, since the pocket wifi is a just a small device similar to the size of a credit card when laid flat, my hunch is that its wifi range is understandably not as wide as your typical home broadband wireless router which is far bigger in size and with antennas. Based on my personal experience using Pupuru in my past 6 trips in Japan, their pocket wifi has a good range of about 10 to 20 meters if it doesn’t pass through any walls. When I went shopping at the flagship Uniqlo and H&M stores in Ginza, I remember that I can still get the signal of the Pupuru wifi device in the possession of my travel companion if we are “on the same floor” within the same shop. If I cannot locate the wifi signal of the pocket wifi anymore, I know that my travel companion has moved into a different floor in the shop and we need do some hide and seek. 🙂 So in this case, having multiple pocket wifi devices could have eliminated the need for hide and seek. You will most likely have free wifi access in your hotel. Although I fully understand that you wish to have Pupuru as back-up or even as your main wifi. Hotel wifi can be a hit or miss even for 4-5 star hotels in Japan from my personal experience. More than this, I think the major benefit of renting multiple Pupuru pocket wifi devices is that your travel group can split without having to lose wifi connection, have different itineraries for the day, go shopping in different shops, and just meet up together at a meeting place once you are done with each one’s unique itinerary. While I may not be able to answer your question directly whether the range of a pocket wifi device can cover multiple rooms in a hotel, I hope that my personal experience and my little experiment above will help you make an informed decision. In any case, I’m sure that having a Pupuru pocket wifi will make your trip better as it did for me in my past 6 trips to Japan. I wish you and your travel group a fun and happy trip! Take care. Thanks so much for your detailed reply. Based on your feedback, we will rent two pocket wifi for the trip. For our itinerary, we will visit Tokyo, Hakone, Mt. Fuji, Kamakura/ Enoshima, Nikko and Kyoto. Do we need the high speed or the AU version (more expensive)? Since this is our first time in Japan, we do not plan to venture into any off the beaten path. In addition, in their web site, I saw they advertised of the pocket talk. Have you used one in your trip? If yes, what was your experience? Or any of your blog fan’s experience? Do you have any blog written about airfare searches to Japan? It’s great to hear from you again! Since you will be in usual tourist spots in Japan, will not be in Okinawa or Hokkaido and assuming that you will not be staying in a ryokan in a remote mountainous area, I think the Pupuru high-speed version should work fine for you above 95% of the time. While there is a possibility that you might not catch signal while behind mountains or while in the middle of a lake, it should not be a problem if you keep on moving. So for example, you might not be able to catch a signal while in the middle of a lake but once you get to the boat dock or nearest station, the signal will be back. For pocket talk, I have not used it in a real case scenario yet. In case you decide to try it, I’m excited to hear about your experience. Unfortunately, I don’t have any blog about general airfare searches to Japan. But my number 1 tip is for you to land in Haneda airport instead of Narita airport if fares are almost the same. Haneda airport is nearer to Tokyo city compared to Narita. Also, if you can book an open-jaw flight flying in to Tokyo and flying out of Osaka or vice versa, that would be better so you don’t need to take a u-turn back to your arrival airport. Hope this helps! Happy travel planning. One more thing. The device can be used for more than one phone correct? Yes, you can connect up to 10 devices at a time with Pupuru pocket wifi. 1. We’re going to Osaka, Kyoto, Hiroshima, Hakone and Tokyo this fall. Is it better to order the wider coverage unlimited pocket wifi (#1 on their website) or the hi-speed unlimited one (#2 on their website)? My inclination is to order #2 but wanted to check that. 2. When it says unlimited, does that mean that when you use this, the data use is unlimited on the device and my phone? So is it connected to my iPhone but not using my AT&T/phone service data plan but using the data provided within the pocket wifi? 3. When you’re in Japan and using a pocket wifi, what are the specific settings you set up on your phone (if you have an iPhone)? 4. Do we need to purchase an additional international phone plan from our phone service in addition to the pocket wifi (for example, in the US, AT&T offers International Day Pass)? 1. The high-speed city wifi is good for major cities in Japan. I’ve tried it on a similar itinerary as yours and it generally worked. Hakone is quite mountainous but as long as you follow the tourist loop, you should be fine. If in case you will be staying in an off-the-beaten path ryokan in Hakone like those really isolated ryokans not in a major transportation stop, I think the broad-coverage will work better. Based on your itinerary though and if you’ll not be in an off-the-beaten area, I think the high-speed city Pupuru wifi will work more than 95% of the time. If in case you wish to keep your itinerary open for sudden day trip changes going to mountainous areas, then the broad-coverage Pupuru wifi is recommended. Just last month, I made a sudden unplanned decision to go on a day trip to Japan Alps (Tateyama Alpine Route) from Tokyo due to good weather, and the broad-coverage Pupuru wifi allowed me to navigate the Japan Alps area without any problem. It even had signal under the mountains. 3. You connect to Pupuru wifi in the same way as you connect to public wifi. Once you turn on Pupuru pocket wifi, you just find its signal on your iPhone and you just type in the wifi password which can be seen at the back of the pocket wifi device. The only difference is that Pupuru is your private wifi so its more secure than public wifi. Pupuru includes instruction manual together with the kit which you will receive, so there is nothing to worry about. 4. Global roaming charges from international phone plan tend to be more expensive. So, in my case, I load up my Skype credits in case I need to make a call. When you are online, you can use Skype either to make Skype to Skype online call for free or make a call to mobile phone/landline using Skype credits. Hope this helps and I wish you a fun trip to Japan! Thanks for your clear answers and quick response, Tiffy. I know you’ve answered my 1st question in the Q&As here before, but this helped me understand the differences even better with the examples. I’m very happy to have helped. Both pocket wifi variants of Pupuru are actually pretty fast in speed. The high-speed is faster though compared to the broad-coverage from my personal experience. However, for a casual user, you won’t really notice the speed difference if you’re using google maps, browsing the internet or watching videos in Youtube. Regardless of which Pupuru wifi device you’ll pick, all I can say is that their pocket wifis are more reliable than hotel wifi from my personal experience. While some hotels are able to provide really really fast speed, the connection can be quite intermittent and unreliable. So essentially, your Pupuru wifi will help you in 2 ways. First, as your internet connection while you are on the road which is kind of essential to figure out the right train/subway schedule on the spot. Secondly, as your reliable back-up internet in case hotel wifi isn’t good. I will be happy to answer should you have any other questions. Okay Tiffy, so I don’t really need the extra overseas plan from Verizon if I’m using Pupuru? I was thinking I needed both? That’s awesome. However you are saying if I want to make a phone call then my overseas plan may be needed. Unless I do what you did with Skype? Do I have this right? Yes, you don’t need an extra global roaming data plan from your mobile provider if you’ll have Pupuru. Pupuru provides you a private wifi connection while on the go. While it does not include voice calls per se, you can use your Pupuru wifi connection to use Skype and make calls. Personally, I prefer to top up my Skype credits and use it in case I need to make a phone call while in Japan. It comes out way cheaper than global roaming call charges. To prevent accidental usage in global roaming data from Verizon, I would suggest you to turn-off the “mobile data” settings on your phone. We plan to visit the bamboo grove in Kyoto. Is a pocket wifi for the rural areas necessary? While the bamboo grove in Kyoto is located in a rural area, it is a major tourist destination and not quite an off-the-beaten area. You should be fine using Pupuru’s high-speed wifi. It looks like pupuru has 2 wifi devices – the unlimited high speed softbank for “city” and the unlimited broad coverage au wifi walker for “suburb”. We plan on going to Tokyo, Kyoto, Osaka and maybe half a day in Kobe. We plan to visit major tourist destinations since this is our first time there. Which do you recommend? Will the city version still function in suburbs and vice versa? If you are just visiting major cities in Japan and you will only pass by a few suburban areas, then the “city” Pupuru wifi should work for you. 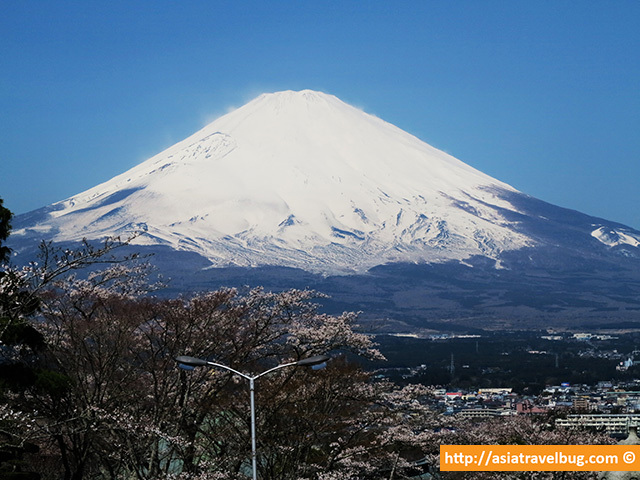 However, there is some possibility that you might lose a bit of connection when you pass by mountainous areas such as certain areas in Hakone, but I don’t think this will be a big inconvenience if you are just going there for a day trip and you plan to follow the Hakone tourist loop. The “suburb” Pupuru pocket wifi should work great if you plan to be in suburbs or mountainous areas for multiple days in your trip or for an overnight stay. To answer your last question, the “suburb Pupuru pocket wifi also covers major cities like Tokyo, Kyoto and Osaka which I’ve personally tried myself. For “city” Pupuru pocket wifi however, it cannot be guaranteed to work in suburbs 100% of the time due to mountains and remote area. Hi. . I looked into the pocket wifi currently there are two options. Hi-Speed (Unlimited/LTE) and Broad-Coverage (Unlimited/LTE). I will be in Hiroshima (one day) and (Miyajima for two) and Kyoto for 5 days and Tokyo for 4 days. Which one should I pick? Thanks for your message. Since you’ll be visiting Miyajima, I recommend you to get the broad-coverage Pupuru pocket wifi. Can someone please tell me if pocket wifi alloww user to place whatsapp voice and video calls or only send text messages? thank you! Since Whatsapp works when you are connected to internet, yes, you will be able to use its voice, video and messaging functionality when you are connected to Pupuru pocket wifi. Hi, did u rent the extra batteries or did u feel the one that’s included is good enough? From my personal experience, the Pupuru pocket wifi typically lasts between 9 to 12 hours in one charge, depending on your actual usage and how many devices are connected to the wifi. To answer your question, yes, the pocket wifi is good enough for a typical travel day. With regards to Pupuru pocket wifi, yes I purchased the damage insurance for peace of mind. Based from my experience using Pupuru 5x previously, the battery typically lasts for about 10-12 hours so I don’t find the need to rent extra batteries from them. However, for extra long days, I always bring my Anker power bank with me so I can charge my phone and the pocket wifi if really needed while on the road. The Anker power bank I have is something like this, it’s light weight and charges ultra fast. Great blog! I will be travelling Tokyo, Osaka and Kyoto for a week. If I requested for the delivery of Pupuru at my hotel in Tokyo and return it either in my last hotel stop in Kyoto or in Kansai airport, what should I do then? I read in previous answered comments that you can leave the Pupuru through hotel concierge. But what about in the airport? Do they have desk in Kansai? Or is there a way I can return the pocket wifi safely to them. Thanks. There is no problem if you receive your Pupuru pocket wifi in Tokyo and return it from Osaka/Kyoto. However, I do understand that some people would want to return the unit while at the airport. In Kansai International Airport, Pupuru has a pick-up desk at the Arrivals Hall where I personally picked up my wifi during a past trip to Osaka. I checked with Pupuru about your case and they confirmed that the counter at Kansai International Airport is for pick-up only. For return however, you can drop the sealed envelope in any mail box prior to your flight check-in. You can check more info about the mail box location here. I have actually seen one at Haneda Airport and these red mail boxes are usually located near the check-in counters. My husband, son and I will travel to Tokyo this Nov 17 for 7 days. Is the 10 gb wifi data enough to use for 3 of us ? We mainly use on Facebook, whatsapps & google maps. Hi Agnes! Happy to hear that you’ll be in Tokyo for autumn this year! Yes, the 10gb Pupuru pocket wifi should be sufficient for your family if you will use it mainly for Facebook, whatsapp and Google maps while on the road. If you intend to do Skype video calls, watch movies or upload a lot of photos, you can either use your hotel wifi or get the unlimited pocket wifi from Pupuru. Thank’s for your reply. Hope we will have a happy family trip to Japan this coming November ! My friends and I will be in Japan from May 14-23. We have been looking for pocket wifi rentals and someone suggested that we try Pupuru. I’d like to ask if how many devices can be connected to 1 pocket wifi? and is the unlimited pocket wifi the best choice for us since we are a group of 8 travelling. Most likely the pocket wifi will be used to go around Japan and for Facebook and Whatsapp. Thanks for your message and I’m happy that you’re considering Pupuru pocket wifi. Yes, you can connect up to 10 devices to Pupuru’s pocket wifi. Thanks for your interest in Pupuru pocket wifi. Yes, hotel delivery is much cheaper since there won’t be an airport delivery fee. The reason for the airport delivery fee is that Pupuru uses a third party pick up counter (ABC Counter) at the airport, making the pick up process very convenient right after you exit immigration. I’ve tried both hotel delivery and airport delivery in my prior trips but use hotel delivery most of the time. The main benefit for airport delivery is you’ll be able to have wifi before you head out to the city, have access to Google Maps and be able to make Skype calls if you need to. Airport delivery is recommended for those staying in apartment rentals where it could be a problem to deliver the pocket wifi prior to your arrival and there is some degree of uncertainty during apartment check-in. During my last trip to Osaka when I booked a vacation rental, the Pupuru pocket wifi delivered to the airport had been a life saver. I ended up stuck outside the apartment in freezing cold weather for one hour due to unclear check-in instructions from the host. Using my connection to Pupuru pocket wifi, I was able to call the vacation rental provider using my Skype call credits saving me from exorbitant global roaming international call charges. If you are staying in a hotel and able to plan ahead how you’ll get there from the airport, then hotel delivery shouldn’t be a problem. In your case, getting from Haneda airport to Ginza is relatively easy and fast with multiple transport types available, so hotel delivery should be fine. Regarding Au unlimited or the YMobile with the 10GB cap version, it depends on how many people will be using the pocket wifi. I typically use up 500mb to 750mb per day on my mobile for Google Maps, Facebook, general web browsing and upload of about 30 mobile photos. In your case, the YMobile with 10GB cap should be sufficient for 4 days for about 2-4 people. I’ve used Au unlimited pocket wifi from Pupuru lately and it is far superior than hotel wifi based from my personal experience. Even wifi in 5-star hotels can be intermittent at times. One of my problems after every Japan vacation is it takes about a week to sync thousands of photos and heavy videos to cloud storage back home. With the Au unlimited pocket wifi from Pupuru, I was able to upload all of my photos and videos while in Japan efficiently and experience blazing fast internet which any money cannot buy at home. I hope my answers will help you decide. Do you know where i can pick up My Pupuru wifi modem inside the Kansai Airport arrival terminal? I’m glad you chose Pupuru pocket wifi. In Kansai Airport, you can pick up your Pupuru pocket wifi from ABC Counter Terminal 1 between 6:15 am to 10:30 pm. I’ve done this myself before and the process is easy. If I remember it correctly, the ABC counter in Kansai Airport Terminal 1 is located in the left side of the arrival hall right after you exit immigration. Hope this helps and I wish you a happy trip! My husband and I used Pupuru wifi for 13 days around Tokyo Japan from March-April 2017. 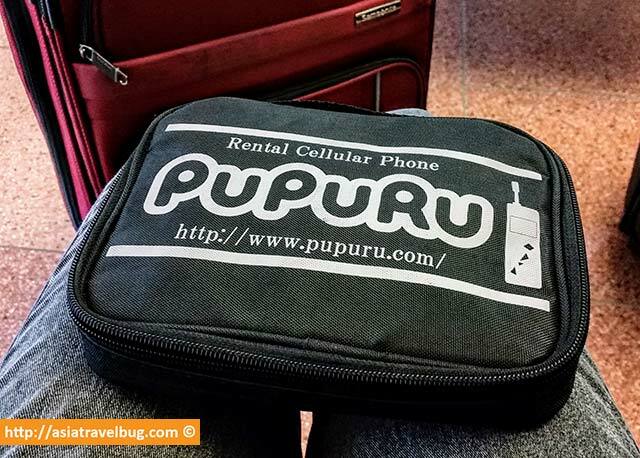 Pupuru was very reliable pocket wifi rental provider. It was delivered to our place at exact time stated. It provided great service anywhere we go and had extra long battery life. It was really useful! Thank you very much for sharing your positive experience with Pupuru pocket wifi. This will definitely be helpful to other readers. I’m glad everything turned out very well. You’re welcome. Have a great day! I had to come back and tell you how incredible my experience was with them. Long story short, our AIRBNB host provided our guesthouse address but the time they would be delivering it would conflict with the prior guest that was staying there. So, I went onto Skype like you said and they were able to easily change the address to our Host’s office address with even sending me a new confirmation, time, and date it will be delivered in less than 30 minutes. Not even in America here that I get so many “Thank You’s,” “we appreciate your compliment”, and “rest assure we want to make your trip enjoyable as possible,” just all of the above! Thanks to your review, I felt confident going with Pupuru Wi-Fi. They make me feel like I’m the ONLY customer they are servicing with time, quality and efficiency. Thumbs up, I will continue to spread the word for them. Have a great day! Can’t wait to go on my trip next week. That’s a fantastic news Reena! I’m glad that everything turned out very well despite of your unique case. Thank you very much for sharing your positive experience. I have agree with you that Pupuru’s customer service is second to none! That’s the reason why they’re my main go-to pocket wifi provider every time I head to Japan. I’m sure you’ll have more memorable travel experiences in Japan next week. The great experience you had with Pupuru is just the beginning. Take care and happy trip! Hi, thank you so much for the great information. I actually did what you did, went through GAC and they were out of stock and then finally got it through to Pupuru. Yet, I’m still not sure if they are sending me this e-mail about making an “ID” for me a confirmation saying my reservation is good and I will be getting my device or am I still waiting for confirmation of availability? How long does I take usually for them to confirm with me? Thanks for your kind words and happy to hear that you were able to book a pocket wifi from Pupuru. I’ve booked pocket wifi from Pupuru on several occasions for peak season travel and they have never let me down. I’m highly confident that Pupuru will be able to allocate a pocket wifi for you. The process for Pupuru pocket wifi reservation is usually like this based on my past 5 experience with them. 1) Right after you pay online in their website, you will get an automatic email stating all the details you entered in the booking (i.e. type of pocket wifi rented, duration, delivery information, etc.). This email from support@pupuru.com will also mention that “Your Order ID will be created and notified in the separate email.” I think this is what you received. 2) Typically after one working day, you will receive an email from one of their staff providing you with the Order ID number. This Order ID number serves as a confirmation that a pocket wifi has been allocated for you for the duration of your stay. I hope this helps and I’m sure Pupuru pocket wifi will definitely help make your trip much more efficient in Japan. Enjoy cherry blossoms next week! Thank you for your fast response. I’m having a little bit of an issue with them because I wanted m pocket wifi to be delivered to Osaka ITAMI airport. They responded back and said they do not have a pickup counter at that Airport. Is that the proper way to give them the right address? Thanks! (Still trying to resolve this issue. And I know it’s not their fault.) Worst case scenario, I may just have them deliver it to my AIRBNB host’s address. I’m happy to hear that you’ve received a response from Pupuru today. The address system in Japan is quite unique and different from western counterparts, so maybe you can tell them to deliver to Osaka Itami Airport Post Office if it is possible. I think Pupuru will be kind enough to check the right Japanese address of the post office for you. You can also contact them over Skype which I did myself before for speedier response. In case above is not possible, yes I agree with you that having the pocket wifi delivered to your airbnb host’s address is a great alternative. Just make arrangements beforehand with your host to avoid any surprises. Thank you again, you are such a great help. My experience with them is great. It’s just my lack of providing them the correct address and not knowing the addresses have to include such specifics. I’ll let you know how things go. Have a beautiful day! Hi! Can i leave the device at the hotel reception the day I leave for my home country? Thanks! Yes, you can. I have done this myself 5 times before and have not encountered an issue in asking the hotel front desk to return the sealed envelope for me. We’ll be in Japan this coming April. First 3 days will be in Osaka-Kyoto then 5 days in Tokyo. Planning to rent this Pupuru Wifi. I think the 10GB is enough. ???? I just have a question regarding on booking online. What should I put on the Pick Up date? As I am a little bit confused. ???? WIll arrive in Kansai Airport on April 2. at early in the morning. Then our departure to Manila will be on April 9 at late night. Thanks for your message and I’m happy to hear that you’ll be in Tokyo right during the cherry blossoms season! I’m so excited for you! Regarding Pupuru pocket wifi, the pick up date is the date when the pocket wifi needs to be delivered. So in your case, you have to enter April 2 as pick up date and April 9 as the final rental date. I typically use between 400-700mb per day on mobile while on the go which includes usage of google maps, travel apps, facebook, emails and upload of 20-30 photos to cloud storage. So the 10GB should be enough for 2-3 people for one week. However, if you plan to use the pocket wifi as your main wifi connection even if you’re in your hotel or if you plan to upload all your photos and videos to cloud storage while in Japan, then I suggest that you get the Au pocket wifi from Pupuru which gives you unlimited data. In my recent trip to Japan, I rented the Au unlimited pocket wifi from Pupuru and it worked like a charm! Hope this helps and enjoy your cherry blossoms vacation! Thank you so much for your recommendation on pupuru wifi rental. Can you use pupuru wifi at the su way or station..?? Yes, the Pupuru Pocket Wifi works in subways or train stations in Japan. Appreciate the hard work you put into maintaining this site. You’re easing our planning pains significantly. I’ve ordered a pocket wifi for our trip based on your recommendation. Thanks Don for your kind words. I appreciate it and I’m happy to hear you booked a pocket wifi for your Japan trip. I’m sure Pupuru pocket wifi won’t let you down! Hello! Thank you for making this very informative blog! There’s just one thing that I’m concerned about, when filling up the card number field, should I enter all 12 digits from my credit card? Yes, just like any online purchase, you have to enter the 12 digits of your credit card in the card number field. I’ve used Pupuru 5x on separate occasions and they’re consistently reliable. Highly recommend booking a pocket wifi with them! Thanks Tiffy for such detail, informative blog – that helps a lot ! 1) Are those dates considered as autumn peak season ? 2) Can we pick up rented device in our hotel in Tokyo on 9/15, but send back from Nagasaki and if yes – can returned envelop be just dropped into regular mail box (not sure if such exists in Japan, though…) or it requires special handling to be sent (i.e. post office, etc) ? Thanks for dropping by Asiatravelbug. Please find my answers to your questions below. 1) Unlike North America, autumn season in Japan starts pretty late. In Tokyo and Kyoto, the autumn is typically at the end of November. In southern areas like Nagasaki, autumn starts during first week of November. September is not autumn in Japan and it is not peak season. 2) Yes, the pick up and drop off areas of Pupuru pocket wifi can be different. You can have it delivered to your hotel in Tokyo and return it from Nagasaki. There is no special handling required since you’re given a prepaid return envelope. I always ask the hotel front desk to return it for me and I’ve never experienced any problems in returning so far after using Pupuru pocket wifi on 4 separate occasions. You can also return it via post office or drop it in Japan Post Mailbox (red mailbox). However, I find returning via hotel to be more convenient. I hope this helps and I wish you a safe trip to Japan! Your article has helped me a lot in deciding to avail of the pupuru rental.. Booked my rental 3 days before my travel date. I was a bit apprehensive at first … But I got perfect wifi signal from my rental during my stay even in the subways. Plus it was conveniently delivered to my hotel before my arrival . Really hassle free in returning it too. I will definitely make use of pupuru during my visits to japan in the future and will highly recommend it to my friends travelling there. Thank you so much for sharing your own positive experience about Pupuru pocket wifi. This will definitely help other readers. I just used them too for the 3rd time this cherry blossoms season and they’ve been very reliable as usual. Definitely, Pupuru is something you can recommend to your friends going to Japan. Hi there…. i just want to find out,im going to Osaka on 3rd of May..so is’it possible to book 1 Pupuru Pocket Wifi by next week 17 of April? ?will it be too late?? ?Please advice..
First week of May is a major holiday in Japan. Booking your Pupuru pocket wifi next week for May 3 should be fine. However, if you can book it earlier, the better. Hope this helps! Have a safe trip! Thanks a lots for your advice and have a nice day!!! Great to hear that Sarah! I’m sure Pupuru pocket wifi won’t let you down. Hi Tiffy, thanks for sharing such valuable information! Just wondering, how many months in advance do you think I should order online? I just learned that fall season is also a big thing in Japan! Thanks and more power! You’re very welcome and I’m happy to hear from you. Yes, fall season in Japan is super peak especially in Kyoto but it is a very lovely season. For super peak season, it is best to book your Pupuru pocket wifi 1 to 2 months in advance to be on the safe side. I just came back from Osaka for cherry blossoms recently and was able to secure my Pupuru pocket wifi booking 3 weeks in advance. But the number of visitors to Japan is rapidly growing which might cause shortages in the future especially during peak times, so booking 1 to 2 months ahead is ideal. Hope this helps. Happy Japan travel planning! Hi Tiffy. Thank you for this very informative article on Pupuru pocket wifi. We are planning to go to Tokyo this year and the tips you shared here will be useful, I’m sure. More power! Thank you for your kind words and I’m so happy to have helped! Hi there, I will be arriving at Osaka Airport at night (20:50). would I still be able to rent a wifi router at that time? worries that the rental places will be closed and i’ll be stranded without a wifi. As pocket wifis in Japan typically book out ahead especially during peak period, I suggest that you book your Pupuru pocket wifi in advance online. The Pupuru pocket wifi can be picked up from the ABC Counter at KIX Airport until 22:30. Alternatively, you can have your pocket wifi delivered straight to your hotel so you don’t have to worry in case of flight delays. Are there post boxes at the airport in which I can return the pocket wifi? Personally, I always ask the hotel concierge/front desk to return the the pocket wifi for me as soon as I check out. I have not encountered any problems so far. In case you wish to return it once you arrive at the airport, you can drop it off at a Japan Post mail box before you pass security screening. More information can be found below. You can pick up the Pupuru pocket wifi at the airport, however you have to reserve in advance online and indicate “airport pick up” so they can allocate one for you. Hi! I would like to ask if its safe to send a scanned copy of my passport to reserve a pupuru pocket wifi? I’m planning on traveling to Tokyo-Osaka for 7 days. Do you think I can squeeze Kyoto even just for a day? Pupuru just made their booking process simpler recently and they do not require sending of scanned passports anymore. So you can go ahead with the pocket wifi booking without worrying about their previous requirement of sending scanned passport. Since you’ll be in Osaka, you can try to squeeze in a day in Kyoto but it maybe rushed. I don’t think it is possible to tour around all the major sights in Kyoto in one day but your day trip should give you a taste of some Kyoto historical sights. Kyoto can be reached in less than an hour train ride from Osaka. If you like nature and historical places, you can give up some of your days in Osaka to spend more time in Kyoto. I hope this helps! Have a safe trip. Great review! I found your post very helpful and informative – thank you very much for sharing this information. I am interested in getting the e-mobile device and wanted to know if it’s possible to check how much data you had used/remaining. Thanks for the kind words! 🙂 From what I know, Pupuru is able to internally track the data usage before the pocket wifi gets dispatched to the users making sure that the unit remains to be usable by the customer. Once you receive the pocket wifi unit, you won’t be able to track the data usage on your own. However, in case there’s a service interruption related to exhausted monthly data limit from previous user, you can always contact Pupuru to request for replacement. I have used Pupuru twice in Japan and never had any issues with exhausted monthly data limit with the e-mobile pocket wifi so far. If you will only use it for google maps and social media updates while on the go, you should be fine with the emobile pocket wifi unit. If you don’t have internet connection in your hotel and plan to use your pocket wifi as your main internet connection to watch videos, upload bulk photos, have long Skype video calls, I recommend you to get the Au brand with unlimited data usage. Thank you very much for your help Tiffy! Nice review! You may have answered this already but did you rent the 10GB wifi or the unlimited 4G LTE? Which do you recommend? Thanks for dropping by Asiatravelbug. I rented Pupuru’s e-mobile pocket wifi with monthly 10GB data plan. The right type of pocket wifi depends on your needs. If you will use the pocket wifi as your main wifi connection while on the go and inside the hotel or if you will use it to watch movies, have long Skype video calls or upload huge photo directories to back-up your files online, then go for “Au” brand. If you will use the pocket wifi as your secondary internet connection and will primarily use it for Google Maps, Skype messages and access to social media while on the go, then the e-mobile brand will suffice. Thanks for all the great advice! I am planning a trip to Japan and have been using your articles extensively. I just have a couple questions about the Pupuru – 1) There are options for “E-mobile” or “au”. What is the difference? I see you talk about E-mobile above, why choose that one? 2) There is an option to get an external battery – when you are discussing the 12 hour battery life, is that just on the regular battery? If so, then it seems the external battery would usually be unnecessary 3) You mention that there is a 10 GB cap, but Pupuru offers a no data limit option – is this new? 4) There is an option for airport pick-up – do you know how this works? Sorry for all the questions and thanks for all your help! Thank you for your kind words. Please find my answers below. 1) “E-mobile” has a 10GB usage limit per month while “Au” doesn’t. However, I’ve used Pupuru’s e-mobile twice navigating Tokyo, Hakone and Gotemba Premium Outlets (outskirts of Tokyo) and found no issue. If you are a heavy data user and will use the pocket wifi for video streaming, uploading a huge photo directory to drop box, do Skype videos or if you don’t have a wifi connection in the hotel, go for “Au” brand. Otherwise, renting “e-mobile” will suffice. 2) Yes, the regular battery inside the Pupuru pocket wifi unit lasts up to 12 hours based on my personal experience. Also, my experience with the long battery life has been consistent as a repeat customer. 3) The no data limit option is the “au” brand. E-mobile has 10GB data limit which refreshes at the start of each month. However, Pupuru is able to internally track the cumulative data usage of pocket wifi before the unit gets dispatched to customers, making sure that pocket wifi can still be used. 4) I’ve always had the pocket wifi shipped to my hotel. However, you can request the pocket wifi to be delivered at the airport as you do the online booking. More information can be found on their website here. Just click “airport delivery information” in the postage fee part. I hope this helps. Have a safe trip! You are welcome Adam. Wishing you a happy trip to Japan! Hi Tiffy, I am travelling to Osaka and Kyoto on October, I wish to know that do I really need to get a portable wifi while travelling? Is it easy to access free wifi services in Osaka and Kyoto? Happy to hear that you will be visiting Osaka and Kyoto this October! Actually, I toured around Osaka and Kyoto without a pocket wifi before and got lost a couple of times. If I would re-do it, I would definitely get a pocket wifi to make the journey much more efficient and to save time. Free public wifi tends to be unreliable when you need it the most. Some of the backstreets in Kyoto do not have commercial establishments so free wifi is hard to find in case you get lost in back alleys. Speaking from personal experience, I strongly recommend visitors to Japan to rent pocket wifi so you can have an access to Google Maps and train schedules while on the go. I think i might need to get the portable wifi with me for the trip. No worries Vivien! Have a safe trip! I’m going to be in Tokyo during the first week in October and looking to get mobile wifi sorted out as read it’s difficult to access wifi as tourists. Is it really worthwhile getting the insurance, as the replacement costs look expensive but if look after it like I would my own phone, I’m tempted not to bother with damage insurance. Also, what would happen in the event it gets lost/damaged in transit either on arrival or when send it back? Did you take damage insurance or not? Thanks for dropping by Asiatravelbug. Losing something while on travel is definitely a valid risk, though in Japan, the risk of getting an electronic device stolen is low as long as you practice common care. Yes, I purchased the damage insurance from Pupuru for the past 2 times I used them. It’s just a few dollars more and it gave me peace of mind which is priceless! Happy to hear that your family will have a vacation in Tokyo this December. I strongly suggest you to book a Pupuru pocket wifi so you’ll be able to check Google maps while on the go. To be honest, I have never stayed in a short term apartment rental in Tokyo and my experience with Pupuru delivery has always been to hotels. But Pupuru does delivery to homes in Japan and you can indicate the apartment address as delivery address when you book your Pupuru pocket wifi online. I suggest that you get in touch with your apartment host to ask for the recipient details whether it should be sent under your name or your host’s name. Tokyo is a safe place and I think the probability of theft is very low. As long as you coordinate with your apartment host on the delivery and logistical matters, I do not see any issue. Another option would be to request Pupuru to deliver your pocket wifi to Narita or Haneda airport so you can pick it up from there. 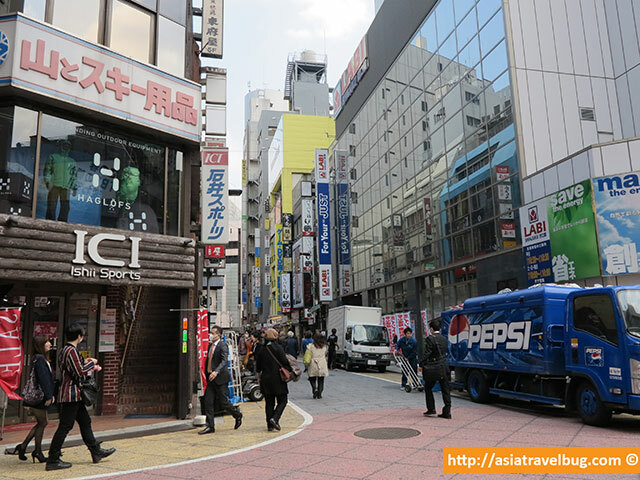 Regarding your question as to where to stay and what to do in Tokyo, below posts might help! I hope this helps. If you have any other questions, you can reply in the comments section or you may reach me here. Thanks for this very helpful post. I will be in Japan for two weeks in November and I was just wondering if the basic charges come with accessories i.e battery and cable for charging or is there a separate charge for the charger? The white elongated device which you can see in the 6th photo is my personal power bank. You can book your Pupuru pocket wifi here. Thank you for your message and I am happy that you found this blog post useful. The scanned passport is a standard requirement of Pupuru so their request is something normal. I do think it is a fair requirement since the company will be lending a pocket wifi unit which costs more than the rental fee, without any upfront security deposit. 🙂 If I were in their shoes, I will do the same for controls purposes. Yes, they are 100% legitimate company based in Japan which I can personally vouch for. I’ve used them two times myself and had no issues sending my scanned passport over email. 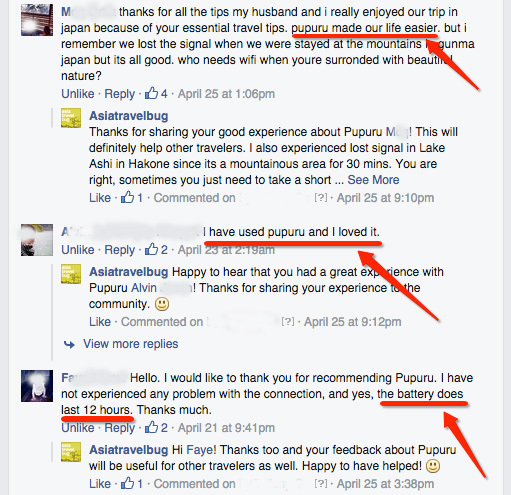 Also, I’ve received independent feedback from the community (Asiatravelbug Facebook Page Members) saying that they are very satisfied with the service of Pupuru. I understand that some people maybe uncomfortable sending scanned passports. To alleviate this, you may want to encrypt the file of your passport and send the file’s password in a separate email to them if this will make you more comfortable. Also, double check if you are sending the file to the right email address ending with @pupuru.com. Just curious what kind of charger do you have or are you using to power all your devices in your picture? I will be traveling to Japan and would like to get something similar in case there aren’t too many outlets. It’s called a power bin USB travel charger and the brand is Le Touch. You should be able to find it in local computer stores. I have used this charger extensively in my travels to Japan and beyond. So far, it is very convenient, compact and saves space since I don’t need to bring a lot of individual chargers for my electronic devices. Hi Tiffy, we love your article and I think we will be getting this brand too. We are arriving at night in Osaka and would be off to Kyoto next morning. Can our day one start on the following day? Or must it start on the day of arrival. Sayang naman ang day one if dadating kami 9pm. How was your experience with it? Thanking you in advance for any advice. Thanks for your kind words. Yes, it is possible for you to start your Pupuru pocket wifi rental a day after your arrival date. In the booking form of Pupuru, you can actually indicate the preferred delivery date and time (10-12 etc; earlier than 10 am is also possible with a minimal extra fee but I have not tried this myself). If you are planning to start your day early on your second day, I suggest that you start your wifi rental on the day of your arrival for peace of mind. This also allows you to be more flexible without the need for you to wait for your pocket wifi to arrive before heading out on your second day. I can’t imagine another trip to Japan without a pocket wifi. I’ve used Pupuru twice so far and they’re very reliable based on my personal experience. I highly recommend them to anyone who will be visiting Japan. I hope this helps and have a safe trip! Hello, thanks for this review. I wilk probaby rent this Device but i AM wondering what is the coverage in Japan. I am gonna Travel from Tokyo to Hiroshima plus some locations between these cities – wilk It be available accross the Island? Thank you in Advance! Hi Tomek! Good question. I’ve actually used Pupuru pocket wifi personally in Tokyo and Mount Fuji area and it worked out very well. To answer your question, I’ve inquired with Pupuru for you and here is their answer. 1. In Hiroshima, main sightseeing area is well covered like near Hiroshima Castle or Peace Memorial Park. 2. In between Tokyo and Hiroshima: Hakone, Nagoya, Kyoto, Nara Osaka, Kobe… In these areas wifi has good coverage. 3. In Miyajima, west side of Miyajima is alright where Miyajima city and Itsukushima-shrine stands. But East side is not covered since most of that part is a mountain. I hope this helps but if you have any other question, you can actually send your itinerary to them. They will be more than happy to check the wifi coverage for you in case you will be going to non tourist areas. Pupuru’s contact information is available in their website and you can book yours here. Thanks and have a safe trip to Japan! Thank you so much for your review on pupuru. 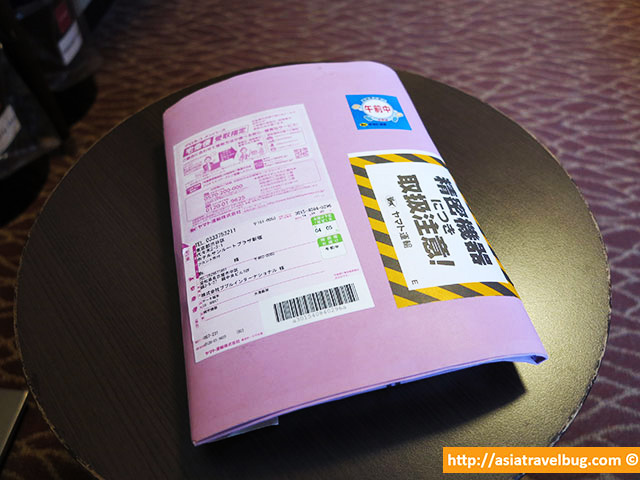 It’s really helpful especially for first-time travelers to japan like me. I was just wondering how much SECURITY DEPOSIT does pupuru charge for rental of Y mobile pocket wifi and if any, how long does it take to be refunded? Again, thank you so much and best regards! Hi Joey! Thanks for your kind words! There is no upfront security deposit charged by Pupuru. Your credit card will only be charged for the device in case you damage or lose the rented pocket wifi unit. For extra peace of mind, you can avail the damage insurance add-on for a minimal fee. I’ve used Pupuru twice and had no issues whatsoever. Japan is a safe country and it is unlikely that your pocket wifi will get deliberately stolen. 🙂 You just need to exercise the same care to the rented pocket wifi unit as you would for your own mobile phone. And ensure that you return it before you fly back home. This is such great news! We are very much looking forward to our trip and all your input is, as usual, very informative. Thank you very much and more power to your site! hi. how many people can share in 1 device? do they allow sharing? Hi Chie! The e-mobile pocket wifi offered by Pupuru allows you to share and connect up to 10 devices at a time. So, yes, you can share the wifi connection with your travel group as long as you don’t exceed the device limit. The e-mobile pocket wifi is now called Y mobile pocket wifi FYI. I hope this helps! You can book your Pupuru pocket wifi here. A very useful article Tiffy. Planning to revisit Japan sometime this year so this would come in handy. Thanks so much. Thanks for your kind words and I am happy that you found this blog post useful. I’m pretty sure you will find Pupuru pocket wifi to be extremely useful in your next trip to Japan. Hi Tiffy, and thanks for your speedy reply to my earlier post. Will the combination of pocket wifi with my Australian smartphone let me make calls, or only connect to the web. Sorry I just noticed your reply today. If you are connected to the pocket wifi, you can make a call using Skype using your smartphone. You just need to install Skype in your smartphone and buy call credits if you wish to call a landline or mobile phone. If you will be calling someone with Skype account online, they you won’t need to have Skype call credits. This is a very informative post. Thanks for the tips! Hi Tiffy, nicely written article. I’m going to Japan in March. Will I also need to rent a smartphone to go with this, or use my iphone from Australia. Thank you for your nice words! There is no need to rent a Japan smartphone together with the pocket wifi to stay connected. You can use your iphone from Australia and any other device (tablets/laptops) to connect to your Pupuru pocket wifi. You can actually connect up to 10 devices simultaneously using the pocket wifi issued by Pupuru. So if you will be traveling together with family or friends, Pupuru pocket wifi will really come in handy. Thanks Peter and I’m happy that you found this article helpful. Nice blog and very useful information regarding the Pupuru pocket wifi. I have just booked a pocket wifi with them now after reading your article. We will be using it next week from Dec 30 to Jan 4. Asked them to send the pocket wifi to our hotel in Tokyo. More power to your blog and keep it up! If you have any questions about Tokyo travel planning, please feel free to let me know. I wish you happy holidays and a great winter trip in Tokyo! Just want to say thanks for the great info you had regarding pocket wifi. It is really of great help to us first timer to visit a great country like japan. Hope PUPURU’s unit will really help us during our 10 day stay in japan from dec 27 to jan 5. I’m pretty sure that Pupuru pocket wifi will be of great help to you especially in navigating Japan. Despite being a technologically advanced country, free wifi in Japan is rare. I find it easier to get a free wifi connection in a random restaurant or mall in Manila, than to find a free working wifi connection in public in Tokyo. Pupuru has great service and the pocket wifis that they rent out have extra long battery life! I have used them 2x so far and each experience has always been very positive. I wish you a happy new year trip to Japan! I was wondering if you’re aware if i can rent the wifi router even if my point of entry is Tokyo but my point of departure is Osaka. Thanks for leaving a message in my blog and I’m happy that you found the post useful. To be honest, I have never tried returning the pocket wifi in another location. But I do not see any issue in returning the rented pocket wifi in Osaka as the pink pre-paid return courier envelope can be used in any post office in Japan. To be on the safe side, just put a note in your booking that you plan to return the pocket wifi in Osaka. It could be tricky to find a post office given language barriers. A much more simpler way to return is to have the return done by the hotel front desk or concierge. I’ve done this several times and found no issues with hotel returning the pocket wifi for me. I would like to ask something. I’m gonna stay in Japan for 6 months with student visa. Does Pupuru have a long term pocket wifi rental? And could I order the rental plan when I’ve already arrived in Japan? By the way, your posts are great. Thanks! Hi Sarah! I am very happy that you found this blog to be useful. Yes, Pupuru offers long term pocket wifi rental. You can book online for a maximum of 90 days but you can always extend the rental for another 90 days by calling them before the first 90 day expires. There should be no problem in booking the pocket wifi rental plan from Pupuru when you arrive in Japan. However, I do suggest for you to book a week ahead of your arrival to ensure pocket wifi availability. Sometimes, pocket wifi rental services in Japan can sell like hotcakes especially during high season (ie. spring season or autumn). I have used Pupuru twice in Tokyo and can recommend them highly with no complaints whatsoever. You can book the Pupuru pocket wifi rental here and adjust the # of rental days to 90 days. I hope this helps and I wish you a happy trip to Japan!